The Smoothwall's major system components are separated into individually installed modules. Modules can be added to extend the Smoothwall’s capabilities, or removed in order to simplify administration and reduce the theoretical risk of, as yet un-discovered, security threats. Note: Modules must be registered against your Smoothwall serial number before they can be installed and used. For further information, please consult your Smoothwall partner or, if purchased directly, Smoothwall. 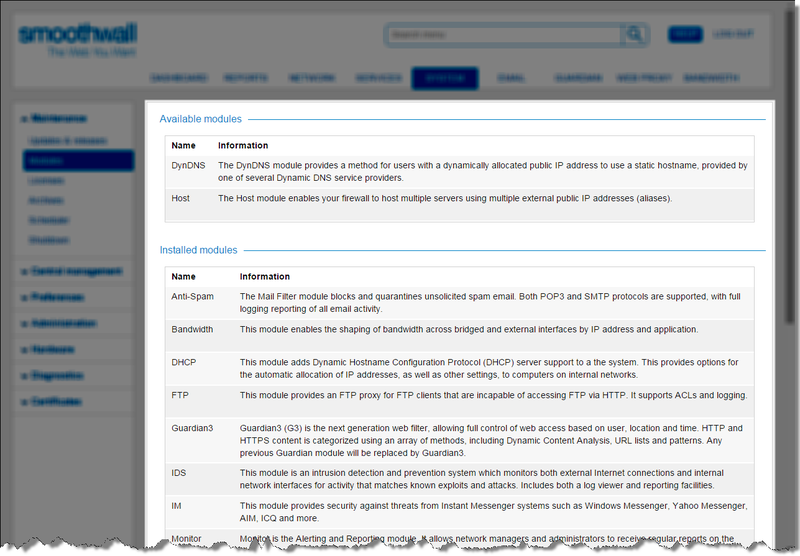 The Smoothwall must be connected to the Internet in order to install modules. 1. Go to the System > Maintenance > Modules page. Note: The information displayed depends on the product series you are using. 2. In the Available modules panel, highlight the relevant module and click Install. Note: Some module installations require a full reboot of the Smoothwall. Please read the module description carefully prior to installation. 2. In the Installed modules area, highlight the relevant module and click Remove. 3. Reboot the Smoothwall from the System > Maintenance > Shutdown page.